As we head in to the Australian Open it’s worth looking at how alignment of individuals with wider goals requires specific planning and how this sometimes breaks down in a corporate context, where the front line goals get disconnected from those of support services. The top players will have planned rigorously for the coming year and for players like Murray, Djokovic and Federer winning grand slams will be priority goals. While the latter two have won multiple majors, Murray won his first last year and is undoubtedly looking for more. These goals require specific training, with the aim of peaking in January (Australian), May (Frnech), June/July (Wimbledon), August/September (US Open). Physically the capacity requirements are different for these tournaments than for the rest of the season. Each major requires that players play best of five set matches and will need to win seven matches over 12 or 13 days to win the tournament. Regular tournaments during the season require the top players to win four or five best of three set matches over five days (give or take a day). The physical demands are different and the coaching teams of the top players will be specific in working on players capacity to ensure they reach their peak, physically and mentally, to perform at their best for the majors. The success of these teams has been evidenced by the number of tournaments that have had the top four players in the semi finals. Last year Murray made the semis or finals of all the slams except the French, where he lost in the quarters. Since winning Wimbledon in 2004, out of 34 slams, Federer has never failed to reached the quarters of any and has lost before the semis only four times. This speaks volumes for the value of the specificity of his training and preparation but what of the corporate world. Federer and Murray are the ones who have to go out and perform but have significant support from teams behind them. In investment banking, for example, there are a limited number of revenue generators, principally in trading and origination, with increasing numbers providing support across technology, operations, risk management, compliance, HR, etc. To ensure goals are reached these need to be aligned and appropriate capacity provided to ensure performance is met whether it be to address the growth in electronic trading, market data or complex products. For this to happen business strategy needs to drive capacity in support services like technology and operations appropriately. 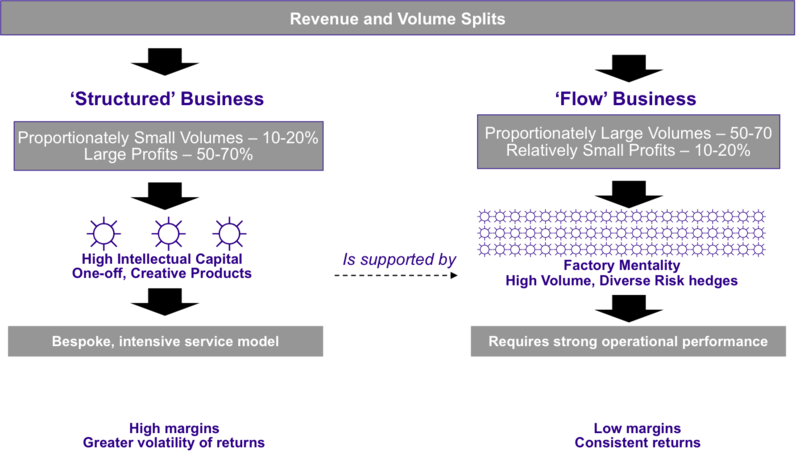 For example in the trading world the proportion of structured business to flow business would be a key element in determining technology and operational support capacity – see diagram. A few years we did some work with a global bank to look at this very issue – analysing how business strategy drove capacity. Simply put, there was a disconnect in the relationship between the plans of the revenue generating divisions and the largest key areas (operations and technology) that supported them. Surveying much of the industry at the time this was not a unique or even unusual situation. Budgets are allocated annually and often seem to have some arbitrary relationship to the previous years numbers, plus or minus depending on the business climate. For the industry to function effectively there needs to be alignment between those who set business goals and those who support them. Elite performance is achieved by those who plan and execute rigorously and engage all those involved. Alignment – ensuring engagement in a team context. The last post was about personal planning for this coming year and how by thinking through our plans in a structured manner provides the foundation for improved performance. Do we understand what the overall team/organisation goals are? Are our goals and values aligned to those of the team/organisation? How do our personal goals for the next year fit with these? If not, can we adapt our personal goals to fit and, if so, how? Are there any tensions between our own personal goals and those of our organisation/team? Of course, if our answers to these questions result in us questioning continuing in our current role we may need an exit strategy. For many, when this happens disengagement follows. After all, studies have shown that large proportions of the workforce in the western world are not fully engaged and in many cases actively disengaged from their work. However, the sporting analogy might be helpful here. For a professional footballer to lose heart, will inevitably lead to a drop in performance. For someone looking for a move to another club this reduces the attractiveness of the player to another coach/manager and a consequential drop in value. If we want to be seen as attractive to another organisation or team in our current work place we need to continue to demonstrate our value. So there needs to be a strategy for improving performance in the current environment while ensuring that you market your talents to potential “buyers”.